A little bit of show-and-tell from us today. We recently refurbished a few pieces that are on display and for sale at Carolina Consignment Shop in Durham. Just a quick bit scrolling for you. Very low commitment, we promise. Antique cabinet with walnut doors. 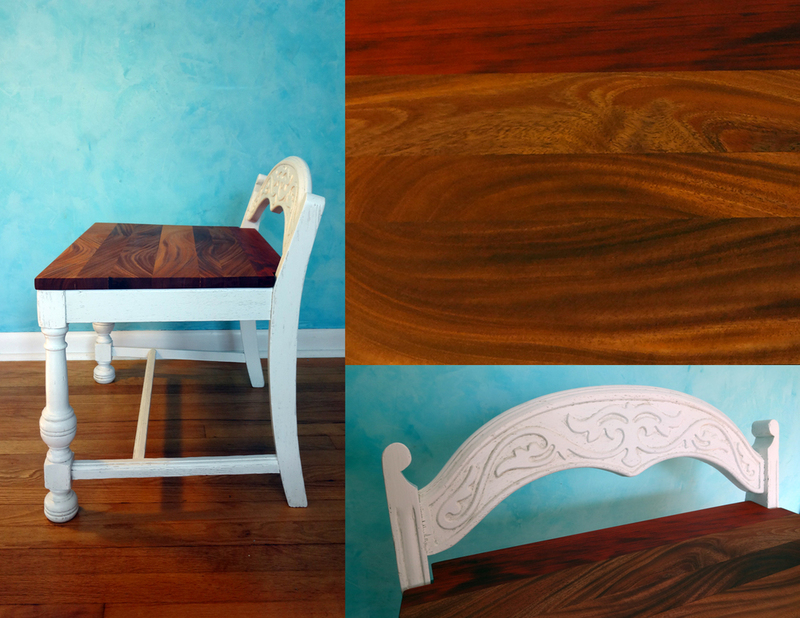 Antique parlor bench with African mahogany and red heart. Solid wood side table with maple, bocote and yellowheart drawer pulls. See? Told you it would be quick. Thanks for being around. Candy talks to strangers. She's a chatter box. And happy as a bird in a bath, too. She is the welcome when you arrive. The smile that picks you up. And the perfect spot to set down your champagne, your bourbon or your twelve-pack of Miller Lite. This one, she'll party. I'm sure she'll tell you about some big decisions she's made recently. About her transformation. About going for it because it's 2014, for crying out loud. She'll tell you that it's been such a long time coming and that she was so nervous at first and then was all kinds of like, you know what Candy, just stop, take a deep breath, finish your sandwich if you want and then ride this makeover train to Hottie Town. It got a bit messy at the start. Sure. And she was a trooper. But in order to fill in some dings and dents she was always going to have to endure a little scraping. She also had all of her bling bling cleaned cleaned. Of course, she was quite the little loquacious lady throughout. Always bright, inviting. Always warm. And she was patient enough to sit through the application of two color coats of paint. A chocolate brown coat applied over her entire body was followed by a light robin's egg blue on the outside and the whole of her doors. See, she likes the distressed look. In fact, talked quite a lot about the distressed look and how amazing it would be and why shouldn't she do what she really wants to even if, sure, it'll take a bit more time but Candy, darling, you're A-plus freakin' worth it. So, her corners and moldings were then lightly distressed with sand paper to reveal the brown underneath. All her hardware was reattached. A brand new drawer liner was popped into position. And after one final review of all her parts and places she was officially released. Restyled and refurbished. She looks great. And while she loves being in the spotlight, the greatest thing about Candy is that she likes to pull you into it, too. Special thanks to Tonya Martin for trusting in our renovation skills. Everything. The Curves, the lines, the dips. Choice. Tops in the room. All eyes on them. But, they've gotten a look at you and they're sizing you up. They lure you in. You're hooked. And they know you know it. And that's it then. That's you on the list, off the list, whatever. You're down. On the ropes. Because, no, these two end tables ain't letting you walk that easy. Two gulls of a feather these ladies are. Inseparable. Steadfast. Loyal. It's been years and ages since we dragged them home from a sad, unending heap. Discarded. Lost. Bitter castaways, these swashbucklers are. Look upon them and imagine their saddled past, hardened coats. Oh, the duplicity. Natural-design. Organic form. Bringing the outside inside. These two end tables have been completely transformed from gruff and bulky into soft and sturdy. The new white coat reveals the details, catches your eye, and provides a bright, clean base for the wooden leaf design on top. Strips of ash wood were cut and pieced together by hand before being finished with a dark walnut oil. These two end tables are a great example of giving new life and value to old, forgotten pieces. They're stylish. They're modern. They're quiet. They're awesome. They're good for you. They're oatmeal. Yeah. I get it. They cook. They clean, right? Come on. They're lamp stands. Here stands our little red dwarf in his delightful little tough stance. He's just recently opened his eyes and has been delivered to his nice, new family. This little guy is the product of a redeemed, little gift card which we had on offer this passed December. So, he's much more than a little purchase. He's a gift. And, as you'll see, he's full of little surprises. His little door opens downward, supported by a metal rod hinge and a custom-made zebrawood lid stay. This reveals the inside of his little body where he offers you storage in a deep cabinet and a shelf to keep your things organized... the practical little fella. His door itself can hold a variety of items from dessert plates and glassware for entertaining to decorative and accent pieces for everyday decor. But, he's more than just a little storage. He also has a lot going on "upstairs." Resting on top of his little head is a tray. And inside that tray is his great big metal saw blade. It was this saw blade and a set of four turned legs that set about the birth of our little red dwarf. 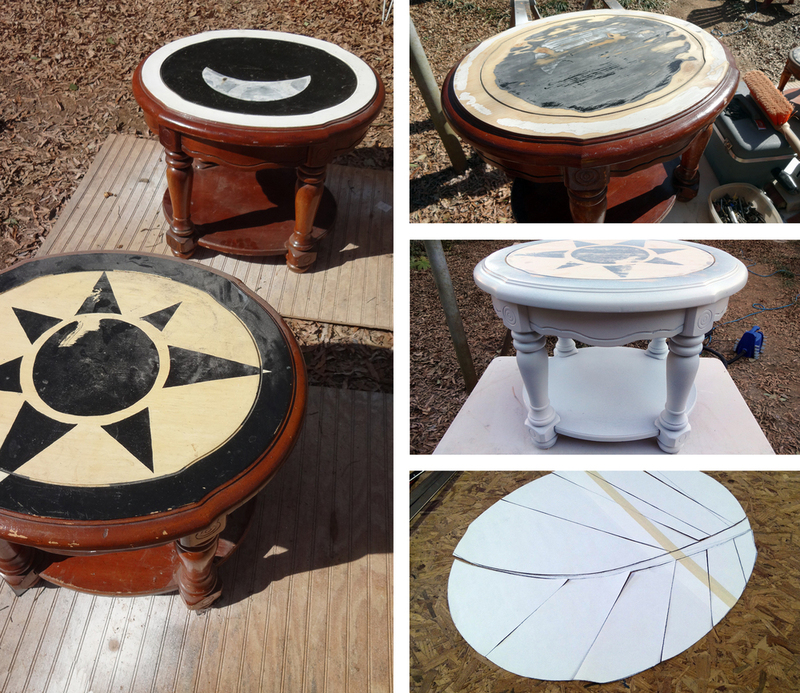 These items were given to us by our clients to incorporate into a table. And frankly, without the blade guiding our ideas, we may never have decided on a tray at all for this little guy. So, our red dwarf has a good amount of grit, history and perseverance coming together to shape that tough little stance of his. Adding in your found and cast off items into our designs is a pleasure. We know it enhances your connection to a piece. But, it also enhances our connection with you. Which is important, because custom design is about people. Custom design is about creating your own hinge or handle or leg or tool because you can't find it in a store. It's about creating your own solutions and delivering something that's more than just one-of-a-kind. It's about delivering something special. And just look at him. This little red dwarf is the special-est. 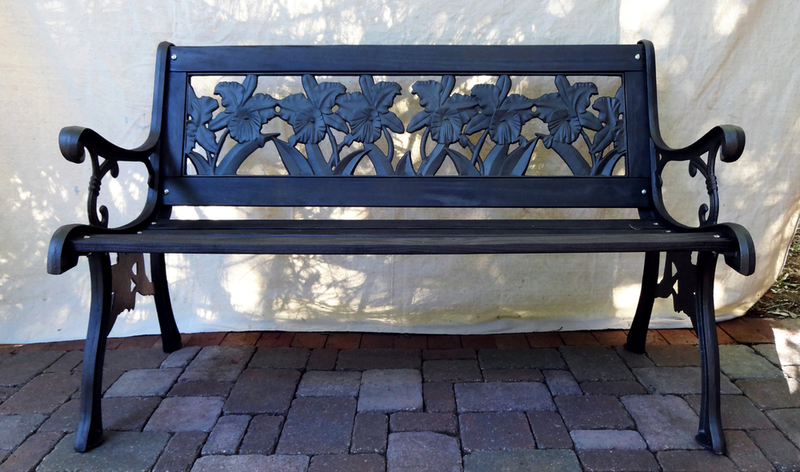 We picked up a very nice, but very weathered iron garden bench some time ago. It was an exciting find and an exciting day. It was all so exciting, in fact, that we immediately went about finding a nice, little spot in the yard for it, discussed our most sincere intentions to restore it and then promptly let it sit and deteriorate for an eternity. Yes, an eternity is a long time. And you can see what an eternity does to an unprotected bench. It uglifies it. It just doesn't care about your sincere intentions. Nature wants to come by and douse your bench with rain and wind and earwigs and reclaim it's stuff. ...A real menace. Know what else is a menace: any mosquito, anywhere. Ever. But one day, you say to yourself, "enough is enough." You start taking that bench apart and thus beginning the restoration. Firstly, we do a thorough inspection. It includes rot analysis, which is widespread. It includes rust analysis, which is widespread. It includes bolt and screw deterioration, which is... widespread! Hot pockets! We've got ourselves a custom job, here. Those iron pieces needed to be scrubbed with a wire brush to remove the rust. There were lots of little nooks to get into and ridges to get around. But, the time you spend doing this, of course, is directly proportional to your rust accumulation, your arm strength or how many mosquitoes are landing on your ears. The rotten slats were completely replaced with pressure-treated wood. Rust removal: check. Rot removal: oh yeah. Most of the difficult stuff is done at this point. Whats left is paint and hardware. 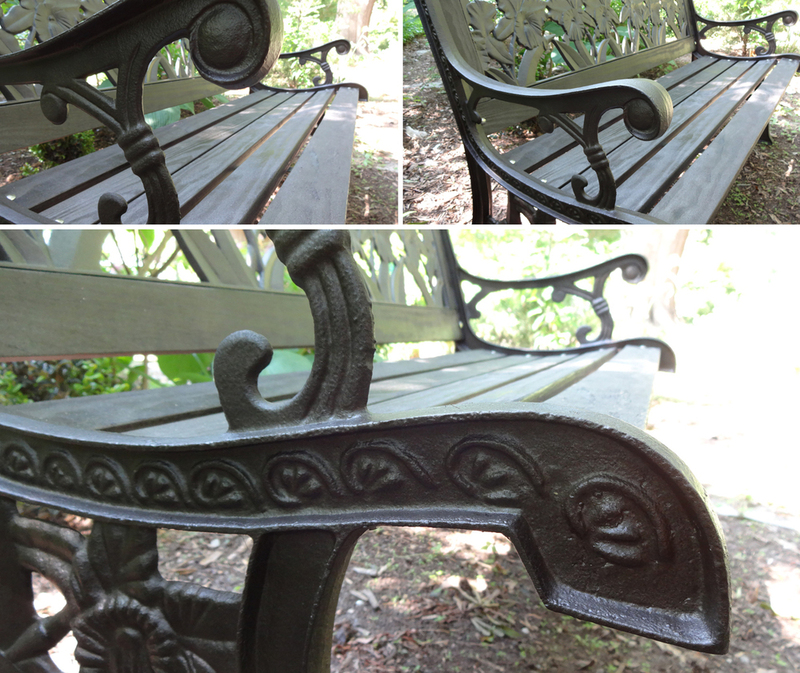 We used a dark bronze metallic Rust-oleum spray over every piece before reassembly. It's not easy to see the sparkly-sparkly in the pictures. But, it's got a sparkly-sparkly, for sure. All new bolts, nuts and screws were easily replaced. But, there was a bit more work to do making two metal supports that go underneath the slats. I suppose we could have bought exactly what we needed somewhere, somehow. But, buying your own metal blanks, cutting and boring into them makes us feel pretty sparkly-sparkly. So, that's what we did. In the end, we've restored a bench to its former glory and protected it from the coming onslaught of uglification by bugs and elements and a variety of mammal poop. We are calling it a success.